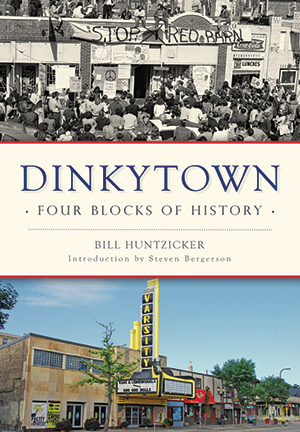 Dinkytown belies its name with a big history and outsized influence on the culture of Minneapolis. It began as a business district serving the University of Minnesota and became a creative center between the flour milling district and a massive railroad yard. By 1875, Dinkytown was a terminus on the horse-drawn streetcar system. The area transformed into a nexus of culture and counterculture with the growth and expansion of the university. Its burgeoning arts scene launched Bob Dylan and The Fiddler on the Roof, and its student activism spawned the Red Barn protests of 1970. Dr. Bill Huntzicker narrates the enthralling history of one of Minneapolis's most influential neighborhoods. Bill Huntzicker, who grew up on a ranch and in small towns in Montana, has lived in southeast Minneapolis for nearly fifty years. Huntzicker, who holds a doctorate in American studies from the University of Minnesota, is a writer and teacher of journalism. He's the author of The Popular Press 1833–1865 (Greenwood Press 1999) and numerous academic articles on nineteenth-century journalism.